Wendy’s is introducing a new line of burgers and sandwiches aimed at solidifying their lead over Burger King in the fast food race. They have a number of new regular hamburgers which have been pretty heavily marketed. They’ve also introduced a new chicken sandwich which has gone largely under the radar. The Spicy Guacamole Chicken Club is absent from Wendy’s website and doesn’t appear to be available nationwide yet. It was available at a Wendy’s I visited recently though, so I gave it a shot. It’s so mysterious, I could only find a picture of a picture of it! A club sandwich is generally a pretty safe way to go when planning a new chicken sandwich. Everyone knows what chicken, lettuce, tomatoes, bacon, cheese and mayo taste like, so any variations are still going to be in that ballpark. The Spicy Guacamole shakes up the formula a little bit, using Wendy’s spicy breaded chicken breast, pepperjack cheese and a chipotle mayo, and adding the titular guacamole. I’m not generally a fan of the spicy chicken breast, and while it works alright here, the numerous spicy elements become a bit overpowering when taken together. The solution for this should be the guacamole, but there’s not enough of it on the sandwich to balance everything quite right. I don’t know if mine was a specific problem or if they skimp in general, but make sure to order extra guacamole if possible. 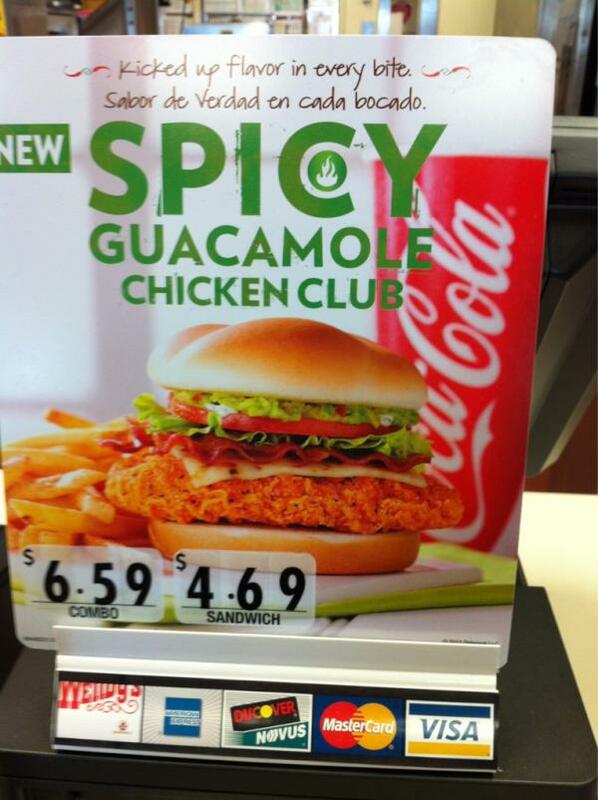 The Spicy Guacamole Chicken Club runs for about $6.50 with a combo. It’s a decent price for a decent sandwich, but avoid it if you don’t like spicy things, and be sure to get as much guacamole as you can. In unrelated news, I found this really weird marketing website in the process of researching the sandwich, and I felt I should share it with you. I’m sorry.